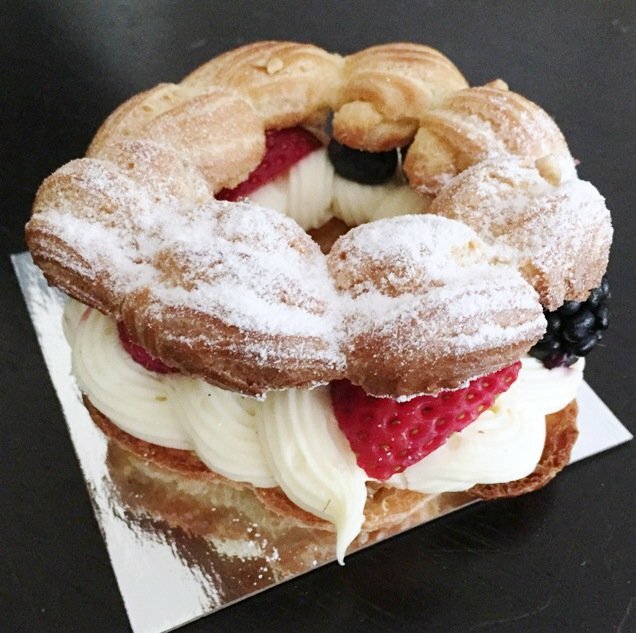 lucettegrace, Raleigh: Exquisite Pastries and Sweets From a Master Baker! A while back I was invited to a media event and tasting for Pastry Chef Daniel Benjamin’s forthcoming patiserrie, lucettegrace. Tastes of quiche, sweets and more, Daniel sent us home with a beautiful chocolate easter egg that showcased his wonderful skills and magic with sweets. 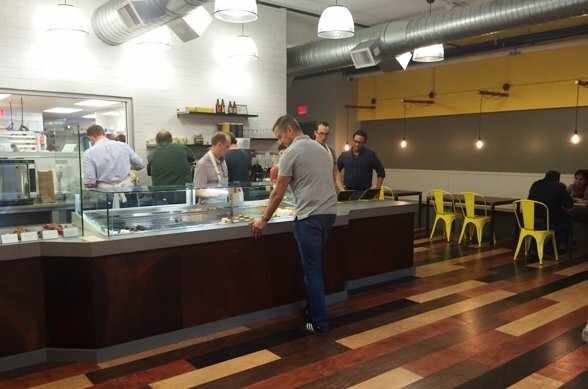 Fast-forward to November and lucettegrace is open in downtown Raleigh and ready to serve the local crowd. 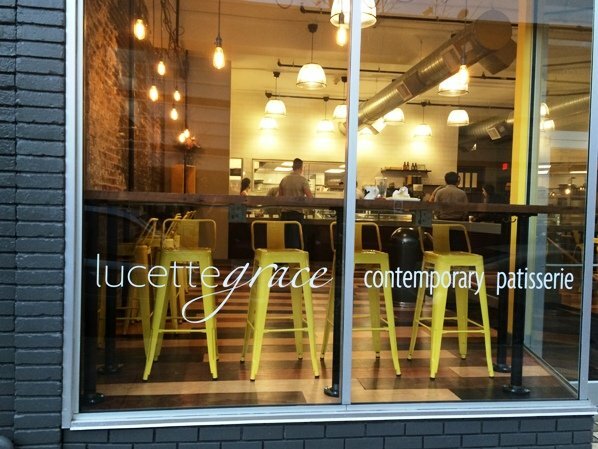 Located in an old Cross-Fit space (ironic) on S. Salisbury street, lucettegrace glows with a sweet, warmth during the evening hours. Inside you’ll find a lovely multi-hued wood plank floor, fire-fly incandescent lighting overhead and a small counter running around the space and in front of the large plate glass windows in front. 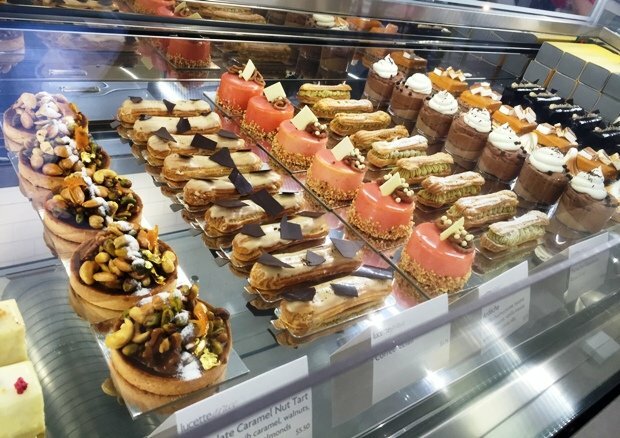 But of course all the action is at the pastry counter in back and Chef Daniel has a lovely array of sweet-savory baked goods on one side, intricate pastries flanking the other side. Over the course of two visits I tried out the salted caramel bar, kouign-amann (sugared croissant) along with a butterscotch pouf. All three were made with love, talent and precision, it’s hard to describe what Daniel is doing at lucettegrace because I have rarely seen sweets and pastries done at this level. Let’s just say, imagine a fancy French pastry shop and spin things up a bit. 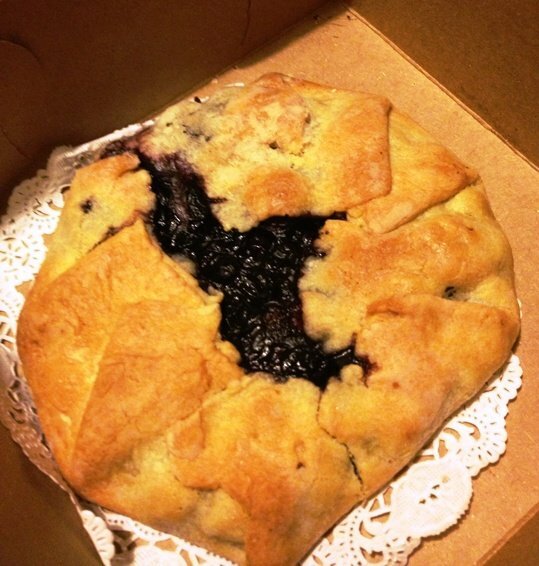 But I can tell you that lucettegrace serves up some of the most beautiful pastries I’ve seen in a long time. Into each life some donuts must fall. Or something like that! While I’m a huge savory guy, every now and then some sweets really hit the spot for me. 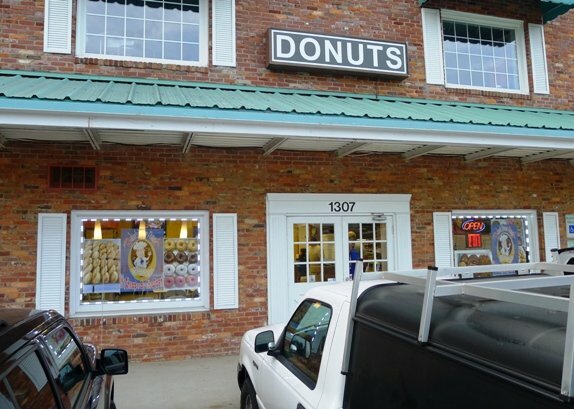 So I spy some pics of a new donut shop in Cary on Yelp and a quick mapping shows it’s right on the way to work. And in the old Wings Cafe I had reviewed a while back, oh well! 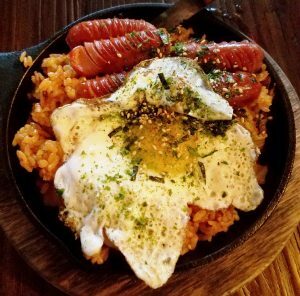 So bright and early on Friday morning I head on over and it’s a really easy ride off of I-440 S. Pull onto Buck Jones and it’s 400 yards on the right, diagonal from the Gypsy Shiny Diner Use the Grand Asia Market entrance to make your way over to Baker’s Dozen. This dusty little part of S. Hills Mall doesn’t have too much going on and inside, Baker’s Dozen hasn’t changed too much. 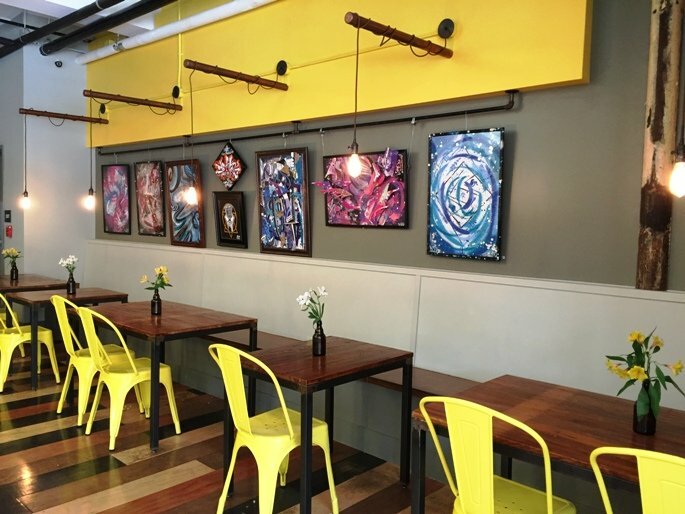 Bright interior paint, small plastic cafe tables and seating along with some new, display cases! They have a bunch of different varieties, somebody must have been up early. I spy some apple fritters along with bear claws but I’m all about the donuts to-day. So I ask for a mixed dozen and ask the person to choose whatever they’d like. 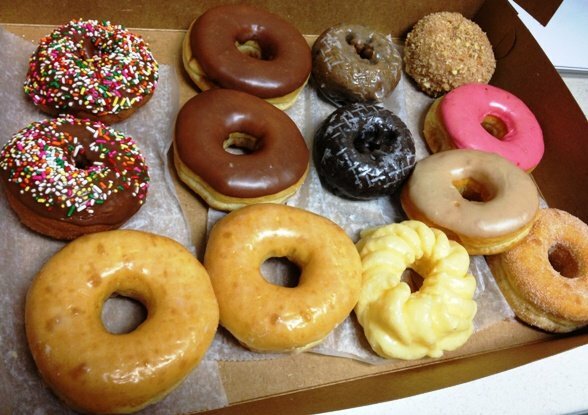 At about $8.50 for a baker’s dozen (13 donuts), the price is right here! 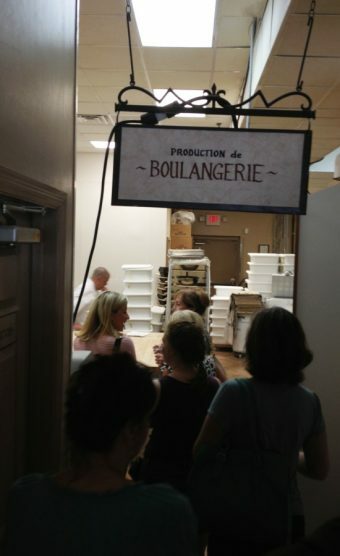 As a long-time fan of La Farm Bakery in Cary I had designs to figure out what the secret is to their delicious goods. 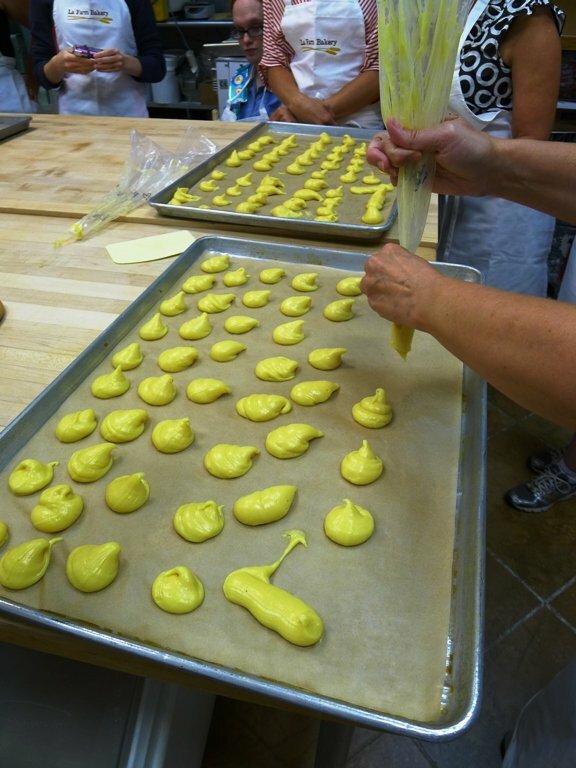 So if you hadn’t heard, La Farm does baking classes from time to time. And while they aren’t cheap ($75), they give you access and advice to their Master Baker, Lionel Vatinet over the course of a 2.5 hour lesson. And I don’t know about you but I’ve always found baking to be a bit of a black art. While I can cook pretty decently in the kitchen, mixing flour, water, eggs, butter and more doesn’t leave you a lot of lee-way to fix up any mistakes. 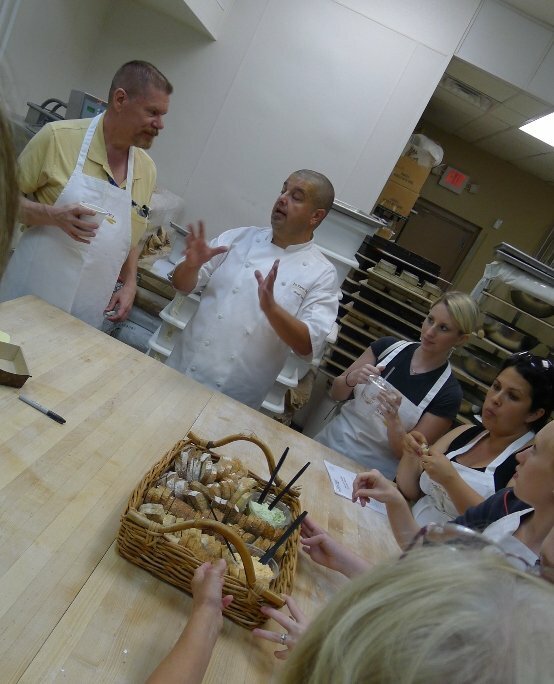 So it was finally time to take La Farm’s Rustic Pastries class and see what their secret is! La Farm’s classes start pretty early (5:30pm) so I had to rush a bit after work. Check in at the counter and then hang out in the dining room to wait for class to start. Thankfully things have slowed down in this very popular and busy cafe, I sip on a glass of vino in anticipation. Eventually Lionel does pop his head out and starts directing people to the back room, kitchen and bakery. We all wash our hands and then pull on spiffy, white La Farm Bakery aprons, we are now sort of official! The class is a mixed group of young and old but perdominantly female. Lionel gets things going with an introduction and he is definitely French given his accent. We do some quick intro’s around the room and it’s time to start baking! The classes at La Farm are a nice mix of demonstration and hands-on. On the schedule for tonight is a fruit tart, crepes, profiteroles and chocolate mousse, yum! In some cases the recipes we’re making tonight (chocolate mousse, chilled pastry dough) would take more time than what we have allotted for the entire class. So we start the recipe and then Lionel already has the mostly finished version in back for us to enjoy. He’s definitely a passionate and engaging guy, I make the mistake of telling him I’m a food blogger so yes, I’m going to get some needling! We start with the crepe batter and it’s always interesting to hear how these basic ingredients (flour, egg, butter, milk, water) can be used in so many different ways. First tip, the batter must have the right consistency so cut in some alcohol to thin it out if necessary. The batter goes in the fridge while we move on the to the next recipe. 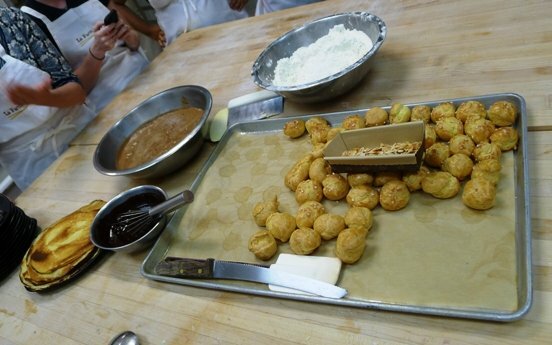 The profiteroles are next, Lionel mixes the batter, puts it into the pastry bags and the class goes about, squirting it on the aluminum trays for baking. We add some rock sugar on top and it goes into the oven. During all these demos, we learn a bit about Lionel’s childhood. While his mother wasn’t a professional cook or baker, she encouraged their activity in the kitchen which resulted in one son becoming a chef, the other a baker. And oh yes, a pinch of salt is 235 grains (inside joke). We move on to pastry dough which is flour, sugar and COLD butter. Lionel demonstrates first but it’s a lot of manual labor. 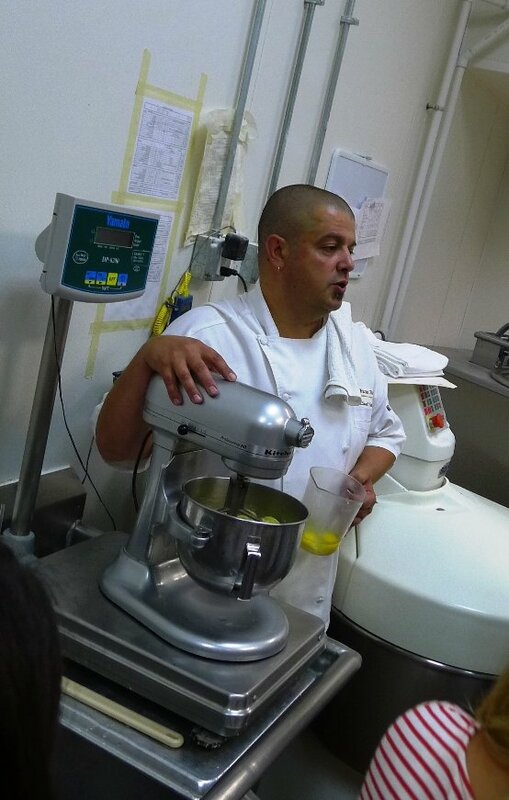 Squeezing and “sanding” the butter into the flour so it’s blended into a soft, yellowish dough. Our versions get wrapped up and placed in the fridge and then we have some pre-made chilled dough chunks brought out. We roll them out, add some raspberries and blackberries and voila, fruit tart! It’s funny to see all the different, odd shapes created by the students, mine looks some place in the middle. Lionel calls these creations “rustic tarts” which allows for the various imperfections and uniquities of our tarts. Into the oven they go and we move on to the mousse. Lionel pretty much demo’s the mousse on his own but it looks so simple. Melted chocolate from a double boiler, butter, sugar and eggs. He whips it into a lovely frothy mix and the chocolate bowl goes around so everyone gets a taste. I’m not a huge sweets fan but I’m looking forward to this dessert! About 2/3 of the way in, a basket of La Farm breads with some delicious spreads are brought out for us to munch on since it’s a long class. We get some drinks and coffee and then continue on. 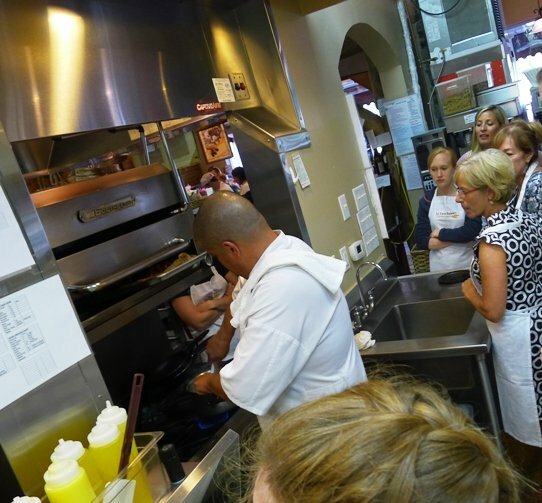 The next step for our class is to take a hand at crepe making. I’ve tried to do this at home and it’s always a mess for me. We go into the kitchen by the stove and Lionel demo’s a couple for us. Spoonful of batter swirled around, wait about a minute and then flip! Brown the other side and out of the pan. It all looks so simple but maybe he has some magical crepe pans!? We all take a shot at it and mine comes out decently. It’s tricky getting a nice even pan of crepe batter and the flip takes a bit of a skill but it mostly works for me. We grab the plate of student-made crepes and it’s back to the prep area. At the table, Lionel has the profiteroles, ice cream, chocolate sauce and almonds. It’s now time to eat our hard-earned snacks! We nosh family-style, I do a profiterole with ice cream and drizzled with chocolate sauce, dee-licious! The pastry has some slight sweetness and airiness like an eclair. A scoop of rich chocolate mousse and I’m done for the evening. While I’m a little bit lactose intolerant, these sweets will be worth any future discomfort! As things wrap up, Lionel passes around some cards for his upcoming book on bread-baking, we grab our baked fruit tarts, the chilled pastry dough and a mystery loaf of bread. And on the way out, it’s bizarre to see the always-busy La Farm bakery empty and quiet. All-in-all a fun and educational food experience! And now that I’ve taken a class here, I can see why people come back for re-visits. Baking is truly an art and requires a lot of repetition and experience. So much of what makes good pastries awesome are minute details and the ability to see and feel when what you’re making is ready to go. And that’s where somebody with the amazing amount of experience that Lionel has can be a huge help. While I’ll probably never be a master baker like him, hopefully I’ll be just a little bit better after my class at La Farm Bakery, bon appetit! Now I can’t imagine two eateries being any more different but during my last visit to Charlotte, I stopped into two great places for foodies, Amelie’s French Bakery and Le’s for Vietnamese sandwiches! Don’t ask me why, I was just a little bit hungry. And let’s just say they are both very special spots but in entirely different ways. Cause there just isn’t much in common between the two other than that you’ll be leaving both with a very happy stomach. Out on N. Davidson is the wonderful, fabulous, delicious and altogether amazing Amelie’s! The boring brick exterior hides greatness behind the front doors. Step inside and you’ll immediately catch sight of a cool light fixture festooned with measuring cups and pots. 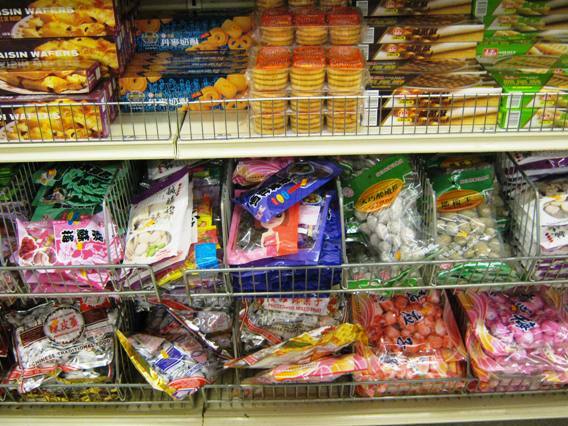 A glance further in and you see two large cases holding all these wonderful, colorful sweets. Brownies, macaroons, eclairs, napoleons and more, you really have to cycle through all the possible pastry options before settling on one favorite. Or maybe two. 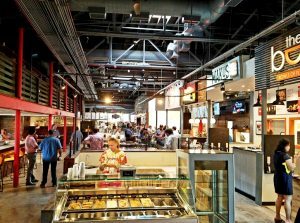 Grab a cup of coffee (self-serve) to go with your sweets and go find a table in back so you can settle in and enjoy it all! Amelie’s has a wonderful side room decked out in bright, colorful faux Baroque-type pieces. Chandelier, fake fireplace, heavy gold-gilt picture frames along with some worn couches. Thinks hipster, shabby chic a la orange or in a knock-off French theme. The place attracts a hip crowd as you can guess and lounging or studying at Amelie’s seems like a wonderful way to blow an hour or two. But what about the treats? 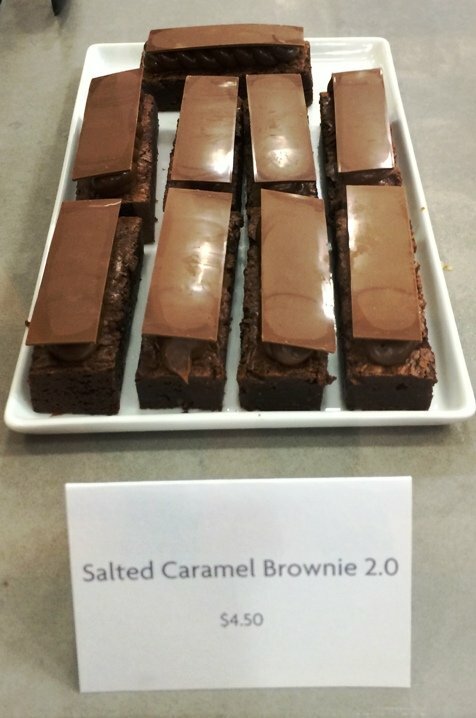 All I can say is the salt caramel brownie may be one of the top five food items that’s been in my mouth. A decadent blast of soft chocolate, thick creamy caramel with a hit of salt, wow! I’ve also done their lemon-raspberry and pecan tart which are luscious, creamy and backed with a thick, buttery crust. 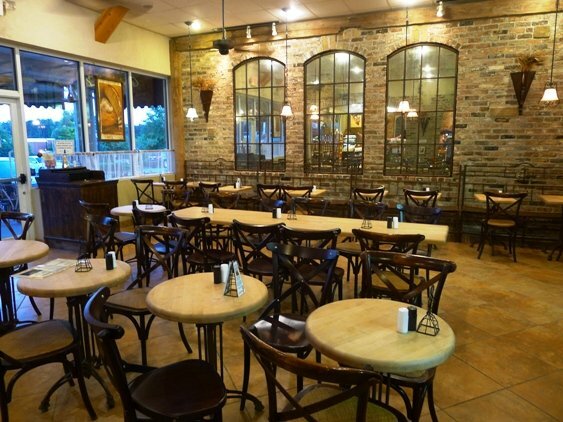 Tie in some excellent coffee and you’ve got yourself a great mid-afternoon or late-night treat at Amelie’s! You really can’t get much luxurious than this for under $6. Now after I had my sweets at Amelie’s, yeah I figured I needed some savory so I head on over to Le’s off of N. Tryon Road. Located in a seedy, run-down strip mall, you definitely have to make an effort to find the place! Funny thing but there’s an Asian plaza JUST like this one in Raleigh so I felt right at home. Le’s is like a beacon of light in this dreary space. Brightly lit, clean, they only do one thing here but they do it really well, Vietnamese sandwiches. I order up a meatball and roast pork banh mi which will take a bit of time to put together, fresh. There’s a small upright cooler with drinks, a couple of chairs and that’s about it here! 10 minutes later my sandwiches are done and at $3.50 a piece, quite the deal. FYI but you can get Le’s sandwiches in both short rolls or long, thin rolls which to me are more traditional. I’ll confess to not eating the sandwiches right away (due to my snack at Amelies) but they were both quite good later on. Light, fresh roll, stuffed with lots of pickled veggies and cilantro. There was enough meat but they weren’t stuffed full which was fine by me. It’s actually a nicely balanced sandwich with savory, tangy and some chew which made for a great snack. Le’s makes quite a nice VN banh mi, wish I had an option like this in the Triangle. From a foodie perspective, my short trip to Charlotte was a bang-up success! Over the course of less than 24 hours I did Malaysian, French, Vietnamese and even snuck in some Swedish meatballs. Plenty of good eating for this little fatty so thank you Amelie’s and thank you Le’s for making my ride home to the Triangle just a little bit easier, bon appetit! 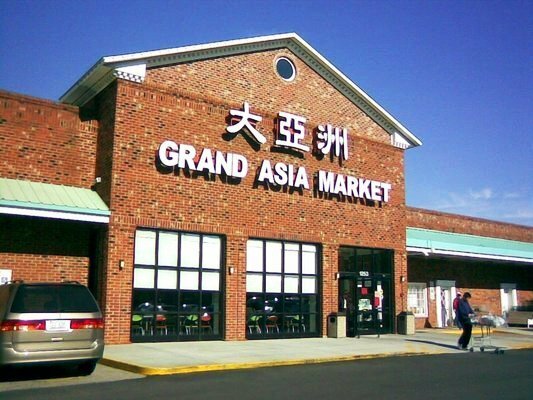 Grand Asia Market in Raleigh- The Best Choice for Asian Groceries in the Triangle! (Updated August 2016) If you love to cook, why not try whipping up something different? 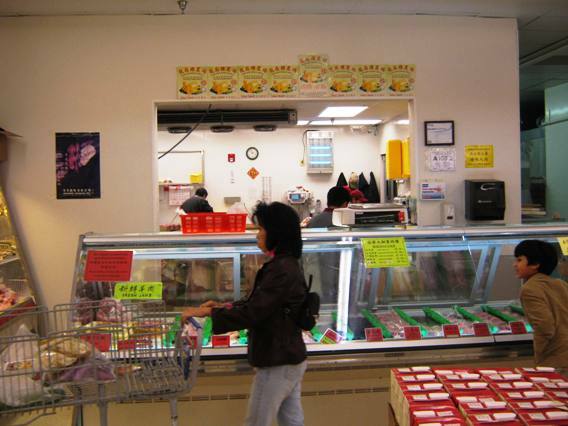 Grand Asia Market in Raleigh (on the Cary border) is a must-do for Triangle residents! 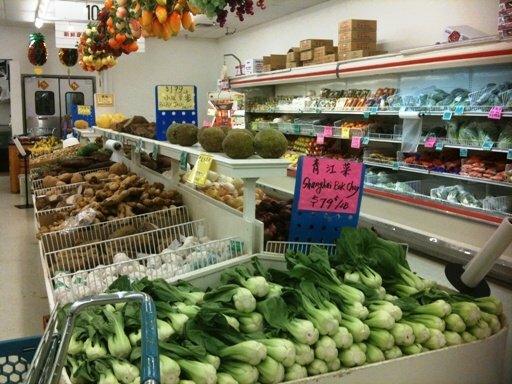 This one-stop market houses a cornucopia of authentic Chinese and Asian food under one roof. From baked goods to dry goods, spices, seafood, meats and a huge assortment of groceries, you can find it all here and also save some money. 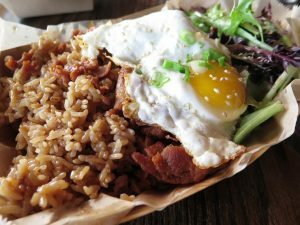 While you can certainly get Asian ingredients at Harris Teeters and other smaller Asian markets, Grand Asia is probably the biggest, cheapest and most popular option in the Raleigh area. If you’re into home-cooking Chinese, Thai, Vietnamese or Indian food, you need to be here. Located off of Buck Jones Road behind a Rugged Wearhouse and next to an NC DMV, Grand Asia Market’s parking lot easily fills up during peak periods. Shopping on the weekend from 10am to 2pm can be a testament to patience so schedule your visits accordingly. But once you step inside you’ll realize it’s worth the effort! In the front of Grand Asia you’ll find a small area of dry goods: jewelry, wooden buddhas, lanterns and a room full of inexpensive kitchen items like pots, pans, plates and utensils. Stock up on the basics and cute Asian kitsch like teapots and chopstick holders. Move into the produce section next where you’ll find a wonderful assortment of vegetables including bok choy, napa cabbage, greens and other more exotic Asian veggies. The fruit assortment isn’t that large but you’ll often find good deals on asian pears and I’ve seen the very odd looking and odoriferous durians here too! There’s too many different varieties of veggies and fruits available here at Grand Asia to describe, but if you’re looking for something more unusual, there’s a good chance you’ll find it here. After getting through the seafood and meat areas, you can roam up and down the aisle ways for the dry and packaged goods. 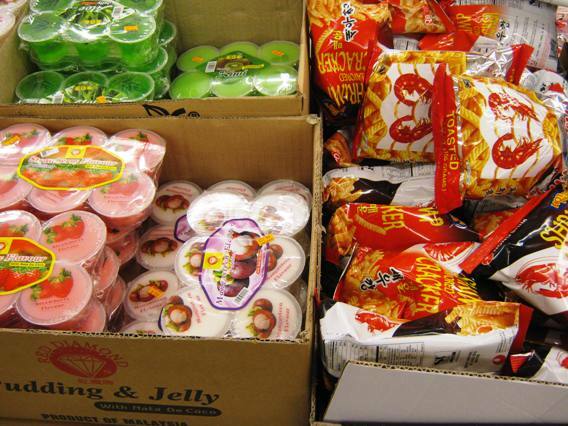 Where Grand Asia really excels is in Asian snacks, packaged noodles, sauces and spices. Even most of the dry goods are going to be unfamiliar to the average American shopper. You’re not going to find Kraft or any of the major brands here. For the snacks, there are a huge variety of favorites such as dried plum (haw) flakes, wasabi peas, pocky sticks, rice crackers and all sorts of traditional Chinese dried fruits. Asian sweets are not my fave but give ’em a try if you’re curious! Next door you’ll find the noodles aisle which holds all manners of ramen, udon, rice noodles and more, pre-packaged and just needing some hot water! Grand Asia has Vietnamese, Thai, Malaysian and Korean noodles in addition to the traditional Japanese ramen and udon. Further down you’ll find all sorts of basic dry noodles for soups and dishes if you want to make it from scratch. Honestly, you’ve never seen so many different types in one location, you’ll go out of your noodle perusing all the choices! The next aisle over is full of wonderful sauces and condiments ranging from traditional soy and mushroom to Sriracha, sesame and sweet chili sauce. A wonderful selection and at substantially lower prices than American supermarkets. Grand Asia also has a great offering of spices including five spice, szechuan peppercorns and curry in larger bottles. Great for Indian and Asian cooking! 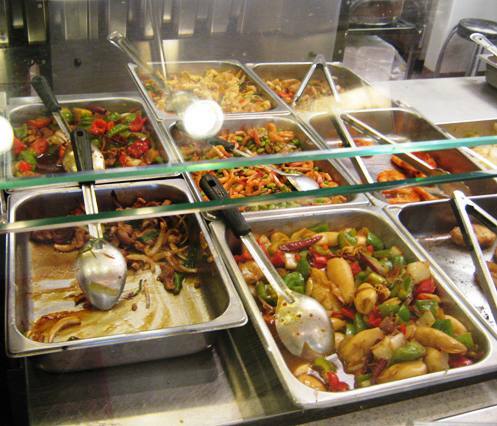 There are just too many choices to describe at Grand Asia but their spices and sauces span the entire Asian continent. Moving out of the dry goods, you’ll end up in their largish refrigerated and frozen section full of freezer cases. Some of my favorites include frozen shumai, gyoza, green scallion pancakes, pork buns, spring rolls, and dumplings. 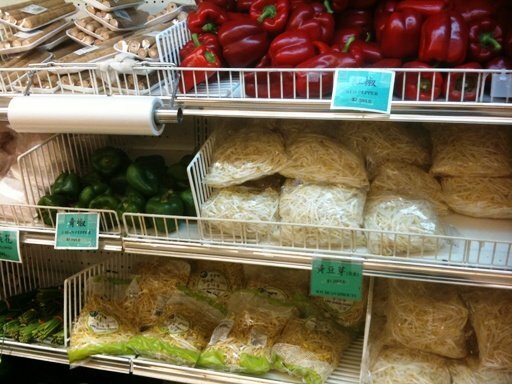 You’ll also find wonton wrappers, fresh noodles and delicious Chinese sausage here! While the taste and quality may be a step down from restaurants, it’s easier for a single person to take full advantage of these frozen goodies for convenience’s sake. 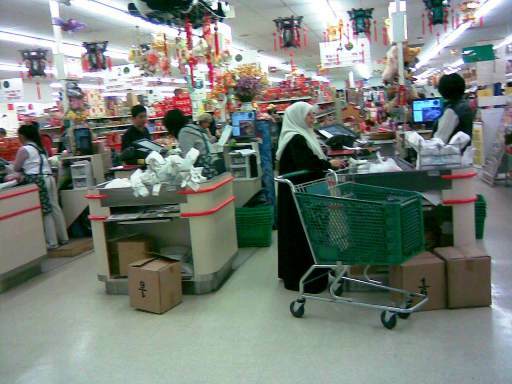 The check-out lanes at Grand Asia are typically jammed but the ladies working the registers are uber-fast. They even tie up your bag into a tight, secure knot and handle that unwraps oh so easily when you get home, cool! Grand Asia takes credit cards, debit cards and of course cash so you’ve got all the necessary payment options. Ok, you’ve gotten the deluxe tour of Grand Asia and perused its wonderful aisles full of interesting and different foods, now what to do? 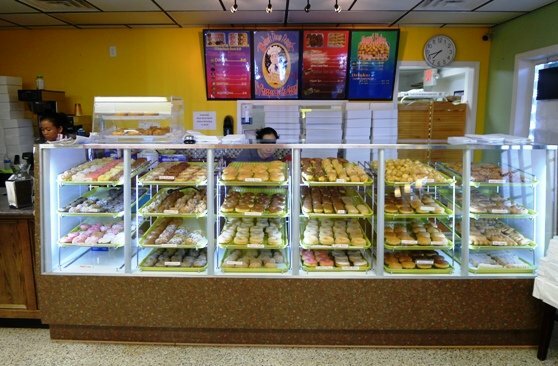 And here’s where Grand Asia really shines: their baked goods and cafe called the Joy Luck Club! Certainly you can stop here before the shopping gets started but I tend to get pretty sluggish after eating here. Take special note that the bakery and cafe ONLY accept cash so you’ll have to be prepared or get some cash from a debit purchase. 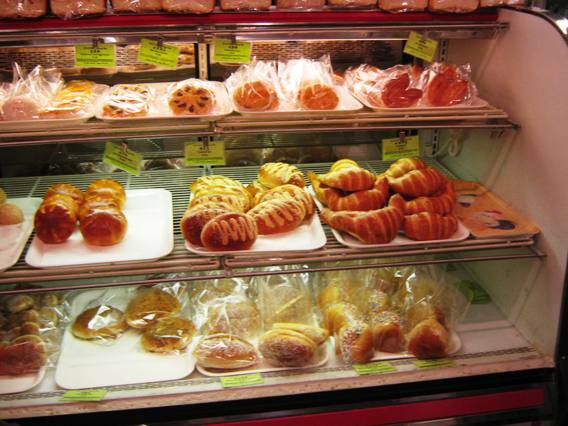 The bakery at Grand Asia is quite good but be warned that Chinese pastries, both savory and sweet, can be pretty heavy. You can get your typical roasted or steamed pork buns along with the wonderful curry beef triangles, and an unnamed pastry made with hot dogs and scallions. 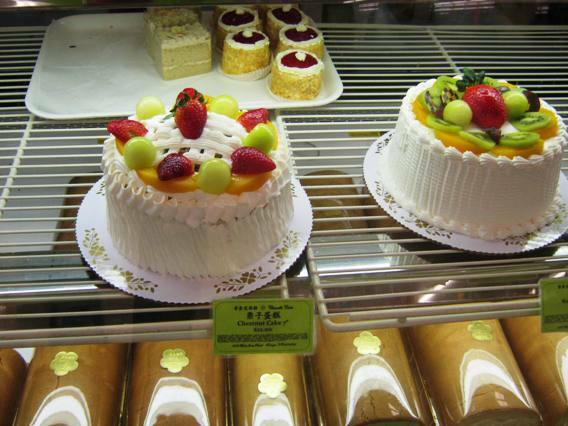 Grand Asia also has some great egg custard tarts, butter cream pastries along with some wonderful looking cakes. Bubble tea is also available here for your kids or those young at heart, who doesn’t like sucking up gelatinous tapioca balls through a straw?! Move around the corner and now you’re at Grand Asia’s little but extremely busy cafe, the Joy Luck Club. The most popular deal is their mealbox which includes three items off their warm buffet along with a nice helping of rice. They do some really down-home Chinese dishes that, believe it or not, my mother would make. Try out their lions-head meatball which is a large, soft pork meatball with braised cabbage. Or try the roasted hongshao rou which is tender but fatty pork braised in a sweet red sauce, fantastic on rice. They’ve typically got at least twelve or more warm dishes and trust me, it’s a lot of food for $6.25! 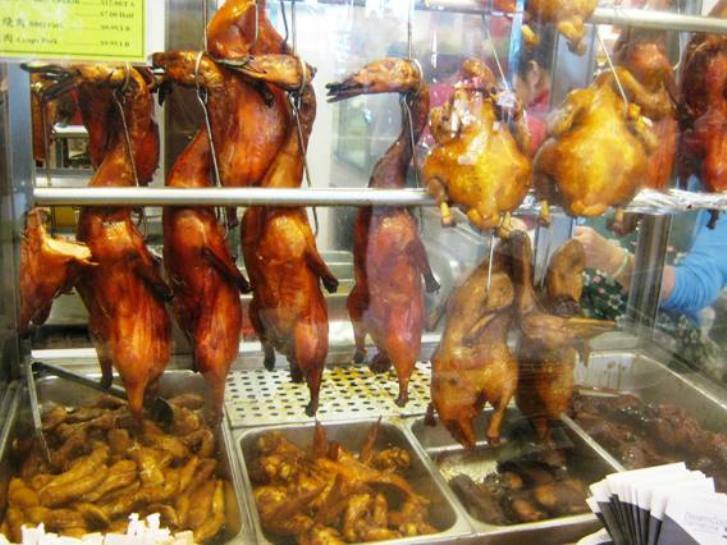 If the mealbox ain’t your thing, try the roasted duck or pork, just don’t get too thrown off by the lifeless duck bodies hanging at the counter. Another authentic option is the beef noodle soup which comes in a thick ceramic bowl and is filled with braised beef, thick soft noodles and dark greens. What can I say but this cafe is about as authentic as you can find in the Triangle area, typical of what you would find in a Chinatown-type restaurant! You really can’t go wrong here and the ladies at the counter are like surrogate mom’s to me since they feed me so well! 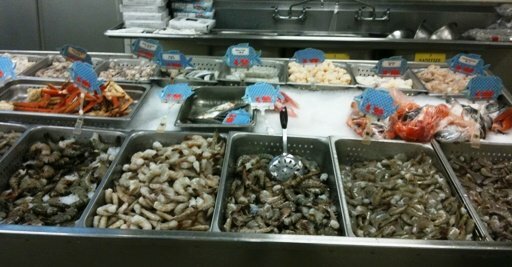 So there you go, a tour of the best and biggest Asian market in the Triangle area, Grand Asia! While most Chinese people would find Grand Asia to be just a typical market, those of you who are less familiar with Asian food will have your senses bombarded with all the unique and different food options available here. Be warned that cleanliness will probably be a step down from Harris Teeter but that’s part of the whole experience. 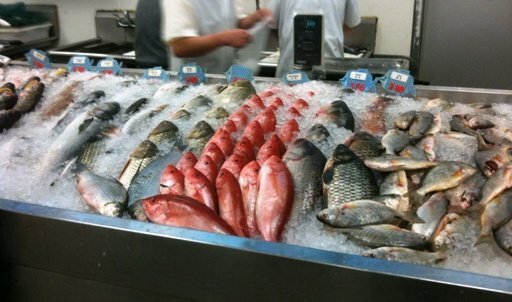 You’ll smell and see things you’ve never seen at your typical American supermarket. And if you’re the adventurous type, I’m sure you’ll enjoy shopping at Grand Asia! Just keep an open mind and curious nature as you wander through the aisles. While I love a good burger or steak at times, Grand Asia Market makes it easy to cook and enjoy all manners of Chinese and Asian food, bon appetit!